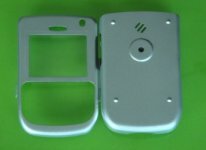 Seidio is a developer and manufacturer of SmartPhone and PDA accessories and today we bring to you a review of their Aluminum Case for the BlackBerry 8700. The case is constructed from aircraft grade aluminum and a neoprene inner lining. The matte finished aluminum is a generous 1 mm (approx) in thickness offering a very solid and rigid feel, yet very lightweight. The black foamy neoprene lining is also 1 mm in thickness securely glued on the inner part of the case which acts as a good shock absorber. The case itself is composed of two parts, the front cover and the back cover, and they are attached via a hinge on the right side with a clip on the left that snaps the covers together. The front cutout for the display is protected with a very clear and thick plastic and it is flush with the aluminum giving a smooth finish. At first the protection for the display was mistaken for glass. 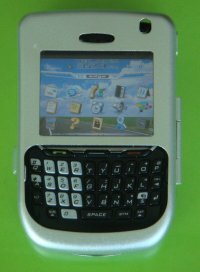 To insert the 8700, you must first open the case, then slide the 8700 from the top. 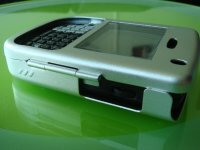 The BlackBerry fits perfectly into the case with just the right amount of tension from the lining that prevents any unnecessary wiggle and also prevents the phone from sliding back out of the case even with the cover open. The front cover snaps close easily but it also too easy to open, in my opinion. I also found that hinge mechanism for attaching the front cover to the back cover is a little weak which causes the front cover to twist whenever I try to remove the BlackBerry off the belt clip (which is included with the case). All the necessary cutouts in the case are there and in the right positions. Accessibility of the power button, mute button, and the jog dial is fine, but I found that it is difficult to use the left side convenience key, the back button, and parts of the keyboard due to the distance of the outer case from the buttons themselves. The worst is the back button since the hinge on the case is located right beside it which forces me to use the very tip of my thumb to be able to reach the back button. Likewise for the keyboard, I cannot reach the keys on the left and right edge with my thumbs unless I turn them inward at an unnatural angle (or learn to use my index fingers). 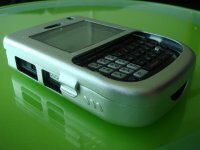 One observation is that the top part of the case is completely open, but this might be so that the radio signal from the BlackBerry isn’t completely shielded. However, even with the large cutout on the top, I found that the signal strength dropped by about 9 dBm compared with the berry out of the case. This may pose a problem for some people who already are located in areas with poor signals. There was no perceptible decrease in sound quality when listening to a call or when speaking into the phone, or when using the speaker phone. In conclusion, this case is offers some decent level of protection at it may be particularly suited for people who are working on a construction site for example. However, this comes at a cost of decreased accessibility to some of the buttons and a reduction in signal strength. 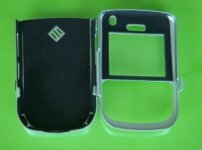 The case retails for $24.95 and may purchased from the crackberry store!